Comfort Level brings together seven artists working in regions across the US that have been directly impacted by climate change, giving a special urgency and immediacy to the works contributed. The year 2017 brought an endless cascade of natural disasters. Hurricanes, fires and floods rose up one after the other; the most dire predictions of environmental scientists and activists manifested just as the year long struggle of native people and protestors at the Dakota Access Pipeline was dismissed by executive order. Initiatives working to prevent “climate change” and to promote clean air encoded in FEMA and EPA policies were simultaneously stripped bare. We have been heartened by a new rage and energy that brings us to the streets and into our Congress peoples voicemails, in-boxes and offices. However, as we write this––six months after hurricane Maria–– the US struggles to feed, house and provide clean water and electricity to thousands of its own citizens in Puerto Rico, resulting in mass displacement and a mental health crisis. As artists we often leave comfort behind in the name of something greater. Comfort Level brings together seven artists working in regions across the US that have been directly impacted by climate change, giving a special urgency and immediacy to the works contributed. Building on Tool Book, a multi-disciplinary art project that provides a direct action platform for artists to share their work and raise funds for non-profit groups, Comfort Level will also premiere a unique artist’s edition titled “Tool Box.” Riffing on the idea of utility, Tool Box allows art to fill the gap between symbolism and usefulness. Each box contains five editioned works from different artists that function to inspire, support and create dialogues of care, communion, expression and comfort. 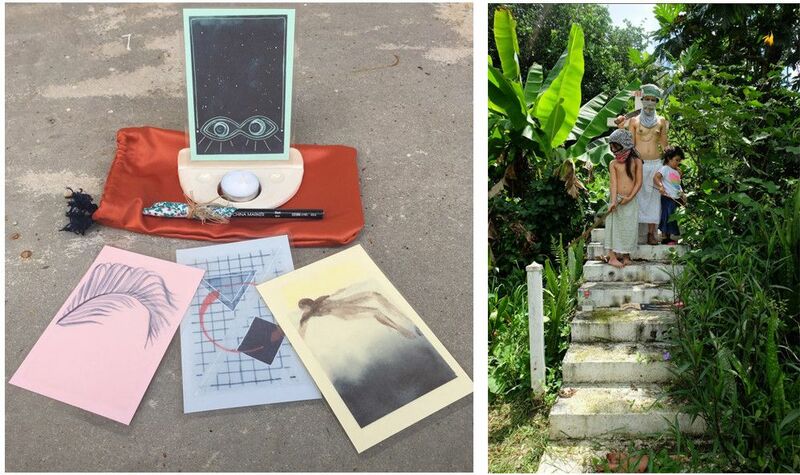 Tool Box is a fundraiser for AgitArte, an organization of working class artists and cultural organizers, who are providing material and cultural aid in the aftermath of Hurricane Maria to the people of Puerto Rico. Awilda Rodriguez Lora’s La Mujer Maravilla: Guerreras #1 asks “How do we transform ourselves into warriors for love and justice?” The performance documented in Lora’s photo and text was inspired by a new law in Puerto Rico which makes it illegal for citizens to cover their faces during public manifestations and re-imagines how we may join together to fight for social justice. Emily Sloan and Carissa Potter use humor and visual puns to transform mundane objects into meaningful metaphors. Sloan’s oversized, trompe l'oeil “screw” sculptures hide out in plain sight on the gallery wall. Potter’s handmade editions of Wrap You Up Blanket and Some Space Ear Plugs offer momentary comfort and respite. Howard Sherman and Sue Havens also present playful work that transforms canvas and clay through layering, texture and surface. Sherman’s expressive large scale canvases collide formalism with a strong sense of urgency while Haven’s repeated layered forms appear to reference things just on the edge of familiar.